Williams Temple was founded in 1929 by the late Bishop Columbus Williams, In 1979 upon the death, of Bishop Williams , Elder Lawrence M. Wooten, who had been a faithful supporter and had served as 1st Assistant Pastor to Bishop Williams was appointed Pastor. Bishop Wooten, PhD, DD., a native Saint Louisana, is an alumnus of Saint Louis University and served as an educator and administrator in the public school system for 30 years. In the year 2000, he was appointed as the presiding Bishop of the Eccleastical Jurisdiction of Eastern Missouri/ Western Illinois Church of God In Christ. 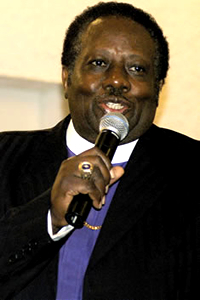 Under the leadership of Bishop Wooten both the local Church and the Jurisdiction have thrived. For example he is responsible for the creation of a locally renown Neighborhood Outreach Center, two Charter schools and the local Church which contains and supports over forty-five(45) outreach ministries. He is a visionary of great consequence; however, his greatest vision is for souls, Bishop Wooten is often heard to say, “It’s all about souls”. Standing by his side and in the gap for him is his much beloved wife, International Evangelist Shirley A. Wooten, who is recognized as an ultimate “God Chaser”, Soul Winner, Evangelist and Prayer Warrior.